What is a “Via Ferrata”? A Via Ferrata (literally an “Iron Way”) is a rock face equipped with numerous metal handholds and footholds. Alongside is a steel cable, attached every few metres, to the rock. This cable acts as a “life line” to which you are constantly attached. Via ferrata allow you to climb rock faces that would normally only be possible for rock climbers. Via Ferrata don’t therefore require all the techniques and equipment of rock climbing making them accessible to a large range of people. This said you should never under-estimate the great danger with potentially extremely serious outcomes if you don’t follow simple, but fundamental principles. France has well over 100 routes. They are mainly located in the mountainous Alpine regions including Corsica and the Pyrenees. However you will also find them in river gorges and on rock faces outside the mountains. There are even via ferrata close to large towns and cities like Grenoble, Annecy and Chambery. Some via ferrata may reach a summit others are located on large rock faces or in spectacular river gorges. Via Ferrata in France are seen as a “fun” activity and in addition to the typical metal rungs and ladders there are also “Tyrolean” traverses, “Nepal” bridges, “Monkey” traverses and other “fun” elements. The vast majority of via ferrata are entirely free to use although in the South of France a few ask for a small payment. Most of the via ferrata are maintained by the local commune using specialist companies to ensure that the equipment is fit for use. Maintenance checks are carried out at least annually but if you notice a problem let the local tourist office know or the local guides bureau. Who Can Climb a Via Ferrata? Via Ferrata are suitable for anyone physically fit and active. The key piece of advice is to choose a route that is within your capabilities both physical and mental. Physically via ferrata range from those that require very little upper-body strength to those where the capability to do several consecutive pull ups is essential. Running out of strength half-way up is not only unpleasant but getting back down can be challenging! Mentally you need a “head for heights”. Rock climbers talk about “exposure” to refer to the feeling of being high above the ground. 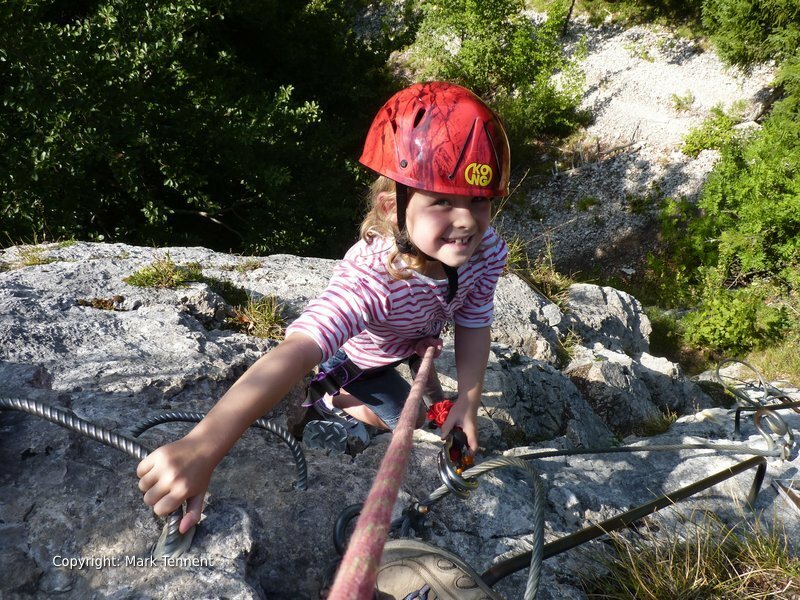 There are via ferrata in France ideal for young children or nervous adults. These routes are often not high above the ground by traversing across a cliff rather than going straight up it. They also may have several “escape” options where if you want to call it a day you can get down easily. Are Via Ferrata Suitable for Children? Children usually enjoy the challenge of a via ferrata but the choice of route should be made carefully. Some routes are especially designed for use by young children. They typically have the “holds” closer together and the cable within easy reach. They also may offer several options to get off early, “escape routes”. Children should be roped up in the same way as for a conventional rock climb. This is to ensure that they can never accidentally unclip themselves from the “life line” or safety cable. In addition to the clear safety element being roped up gives children more confidence. It also allows you to give a “tight” rope or a little assistance on more physical sections. There are various factors to take into account. Naturally by choosing to use my guiding services you benefit from my experience and judgement on choosing suitable routes for you. It’s best not to over-estimate your abilities! If you suddenly feel frightened or nervous half-way up a big via ferrata it can be difficult to retreat. If your arms run out of strength you may find it very difficult to carry on. If you. Your day can quickly turn into an epic and you may even need to call the rescue services! Via Ferrata in France are graded in the same way as Alpine climbs (although the two grades cannot be compared). The easiest grade is usually PD (Peu Difficile – literally a little difficult). At the top end there is ED (Extremement Difficile). Read my article, “How are via ferrata graded in France“. The time taken is different for each via ferrata. The typical time taken is usually indicated at information panels close to the start of the route. There are via ferrata that may only take 30 minutes ideal for an initial “taster”. Some routes may take several hours. In some places you may work just a few minutes to the start of the route whilst others may require a long approach walk. Don’t forget to allow time for the descent! On occasions the descent may still have sections of cable for protection. So don’t take off your equipment straight away. Does it have “Escape” routes? 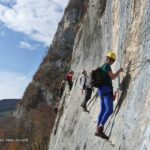 Does the via ferrata have the possibility of “escaping” early? “Escape routes” enable you to cut short the route if time is pressing, the weather changes or if you decide that you have had enough. Climbing back down a via ferrata can be harder than going on and if there are other people coming up awkward. Does a particularly hard section have an option to avoid it by an easier “by pass” route? 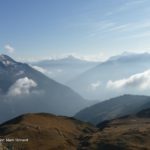 Are via ferrata “open” all year in France? Some via ferrata are “open” all year and others “closed” during the winter months by local bye laws. You can normally find out by contacting the local tourist office or mayor’s office to find out in advance. Occasionally via ferrata may be closed due to safety issues like recent rock falls or potential issues with stability. It’s a good idea to telephone in advance to check and avoid disappointment. It’s worth being aware that in some cases the safety cable is removed for the winter months so that it’s not damaged or the related anchors. 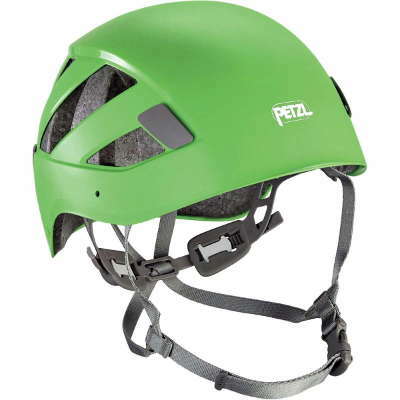 What Equipment Do I Need for a Via Ferrata? To undertake a via ferrata safely you will need the following equipment. This equipment can often be hired from a local outdoor shop. The via ferrata kit or “set” is composed of two lanyards with large, self-locking karabiners. These lanyards then have a shock absorbing system before a loop for attaching it to a climbing harness. There are two types of shock absorbing systems. The most common now is a “rip out” system contained in a zipped pouch. Under the shock of a fall the lanyard inside the pouch literally rips the stitching that shortens the lanyard absorbing the shock. The second, less common now, is a special device that, under heavy shock-loading, allows the lanyards to slip thus reducing the high shock-loading resulting from a fall. These via ferrata sets can be bought or hired from local outdoor sports shops. Some via ferrata sets have a third attachment for a karabiner. This is designed for “resting” when your arms are tired or you want to stop and take photographs. NEVER use normal climbing slings or rope on their own. In the event of a fall they will almost certainly break! They are not designed to withstand the shock-loading produced in a fall on a via ferrata. Harnesses for via ferrata can be a straight forward design for rock climbing and don’t need any fancy extras. Some harnesses are one-size with both adjustable waist and leg-loops. Young children may be advised to wear a full body harness as it cannot slip down off the waist. If hiring harnesses and helmets come along with the via ferrata set. It is wise to wear a helmet to protect you in the event of a fall. It will also protect you from any small stones that may be dislodged by parties higher on the route. This depends to some extent on where the via ferrata is located. If the approach (and descent is on good paths on relatively flat terrain you can wear a pair of training or “approach” shoes. Otherwise it’s best to wear a pair of walking boots that give additional protection to the ankles and security on steep paths. No special clothes are needed however remember you may be in the mountains where the weather can change quickly. Take a small rucsac with warm clothes e.g. fleece jackets, wind/waterproof jacket, hat, gloves as you would wear for walking in mountains. Take some spare food, energy bars and a water bottle as you may get dehydrated. Don’t forget sun cream and your sunglasses too! Depending on the via ferrata’s length and location you may wish to consider a small head-torch, map and compass. Lastly, to protect your hands you may want to consider some leather, finger-less gloves to protect from grazing and the occasional sharp ends of the metal cable. The key “technique” on via ferrata is one fundamental to your safety. It is imperative that you are always attached to the main cable (or “life line”) at all times by at least one of the karabiners attached to the via ferrata set. As you move the karabiners will slide along the cable with you. When you come to a point where the cable is attached to the rock you will need to move one karabiner at a time on to the new section of cable. This ensures that you are always attached and therefore protected. You may find your arms getting tired so the ability to have a “rest” is useful. Some via ferrata sets have a third, short sling that can be clipped into a metal rung so that you can rest, (or take photographs). If the your via ferrata set doesn’t have this you can make one using a standard climbing sling and large HMS / Klettersteig karabiner. This is only for resting and not used during normal progression since it’s not integrated into the shock absorbing system. Let someone know where you are going and when you intend to be back or when you will call to let them know you are down and safe. 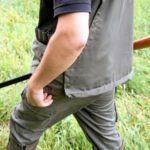 Thoroughly check your equipment each time for damage and wear and tear. Remember you are only as strong as your weakest link in the party. The more people in the group the longer the via ferrata is likely to take. If one person is struggling physically the whole party will be delayed. If you require rescue or witness an accident call 112 and ask for mountain rescue. 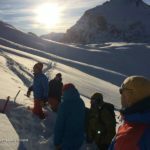 Read my article “Mountain Rescue in the French Alps“. Check the weather forecast before you go on Meteo France. Being caught out in a thunderstorm on a via ferrata with a wet, metal cable is not something to contemplate. The weather in the Alps is often best in the morning during the summer. In the afternoon it is quite common for large cumulus clouds to develop and these may go on to become thunderclouds. It’s best to make an early start so that you are down before any potential changes in the weather. Always undertake a via ferrata in the direction (“sense”) indicated in the route description or on panels at the start of the route. Follow the “country code” making sure you take all your litter with you; remember to shut gates and don’t damage fences. Follow any advice and directions given on particular via ferrata to avoid either endangering yourself or others. Be polite and courteous to other users. If others come up fast behind you be prepared to let them past. Just choose a good moment and then stay still and let them carefully pass you. Do not unclip! By letting people through you will feel more relaxed and not under pressure. On certain parts of the via ferrata, for example, bridges it may indicate that you should only pass one at a time to avoid overloading the structure. 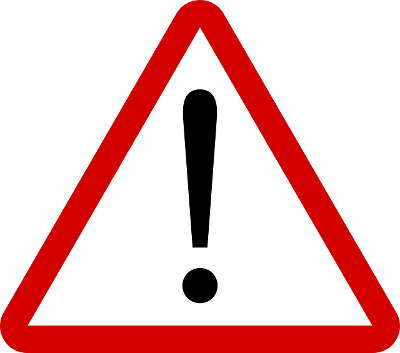 If you accidentally drop something, or dislodge a stone, shout “Below” or “Attention”. 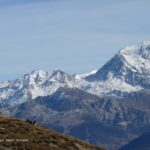 Is the Tour du Mont Blanc Sustainable?